The average U.S. family spends $1,900 a year on the energy bills. By using less energy to keep your home comfortable, you not only spend less money, you also cause fewer greenhouse gases to enter the atmosphere, and ultimately contribute to slowing down global warming. 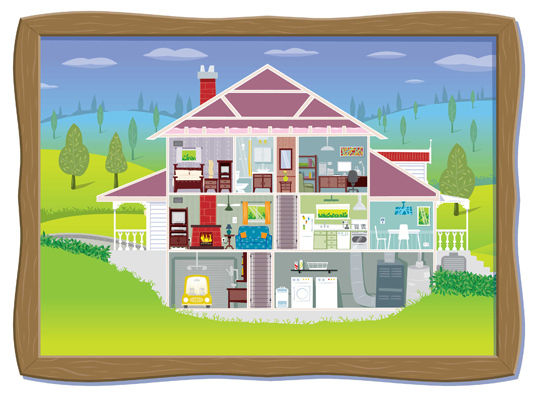 On Monday, May 22, the EPA’s Energy Star launched a new interactive online tool for improving energy efficiency at home. You can click on each room in the house to get specific tips on how to be smarter about the energy you use. It’s a user-friendly, concise, useful tool that helps you make your own decisions about where a little efficiency can go a long way, such as sealing windows and setting your thermostat to a lower temperature. As summer approaches and energy demands escalate, this is an easy way to save some money and spare the planet by making a few choices at home. I agree with Lynn. Not only is this very helpful, but it's organized well and writen for normal people to understand. Plus, it's really cute and not boring! This is a really cute way to teach people about energy efficiency. At least it's not another long and droning information factsheet.